Dragon allows you to dictate text in virtually any application. In order to use commands such as Select <text> or Correct <word>, Dragon needs to know where your cursor is within the document. In some applications, including Microsoft Word 2011 or 2016, Microsoft Outlook 2016, and TextEdit, Dragon can always get that information, even if you use your keyboard and mouse to change text while you are dictating. Some applications, however, do not allow Dragon to find out whether you have moved your cursor. If you dictate in these applications, avoid using your mouse or keyboard. Dragon notifies you when you are dictating into an application that does not support typing while dictating. Click the icon in the menu bar and select Show Guidance. If you use your keyboard or mouse to edit your text or move your cursor within the text, you may lose access to certain features, such as editing text or using Correction. Dragon is working to support as many applications as possible. Check this page for updates to the supported applications list. What does it mean if my application isn't supported? You can dictate into an unsupported application. If you want to dictate into an application that is not on the supported list, you can still dictate text, but try not to use your keyboard or mouse to add or edit text while dictating. Dragon works with applications that support Apple's Accessibility API. Please check with your applications developer to ask about adding support for Apple's Accessibility API. *This list is a selection of common applications Dragon is not able to support. 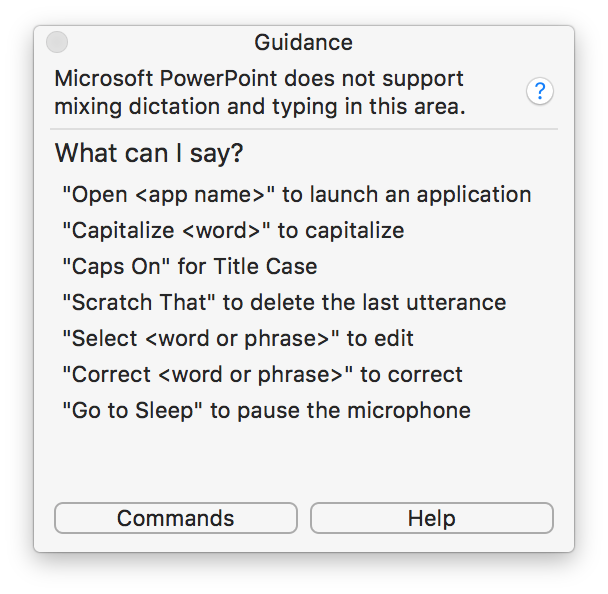 Check the Guidance window for information about an application before attempting to mix dictation and typing. Dragon forgets what it entered in this document. Dragon throws away its recordings of your voice, so using Correction on existing text is no longer possible. Dragon reads all of the document's text from scratch. This means Dragon knows exactly what text the document contains.